Web platform v1.1 is back in stock at Seeed Studio. The Dangerous Prototypes web platform is a tiny server designed for networked hacks where a full PC is inconvenient. There’s lots of interesting projects that bridge the internet to microcontrollers, but most of them have a PC in the middle to handle network stuff. This business card-sized internet appliance can connect to web services, control physical objects from a browser interface, or email sensor status reports; no PC intermediary required! Get an assembled web platform for $40, including worldwide shipping. This entry was posted on Monday, January 16th, 2012 at 11:00 am	and is filed under web platforms. You can follow any responses to this entry through the RSS 2.0 feed. You can skip to the end and leave a response. Pinging is currently not allowed. A quick teaser – I have some new rock-solid firmware for Web Platform running Contiki 2.5, I will post it up over the next few weeks. Nice to hear, can’t wait to play with it! Sounds very nice, looking forward to see it published ! Raspberry Pi is very exciting, and we are all looking forward to it. It’s a completely different beast though, more like a full computer. The web platform is something a hobbyist could use as a basis for their own custom hardware. Few will be able to hand-solder the Broadcom processor or RAM used on the Pi, and making multi-layer PCBs is very expensive. Its a package deal for US$25, PnP PCB. I was just comparing the price to performance of both the products. 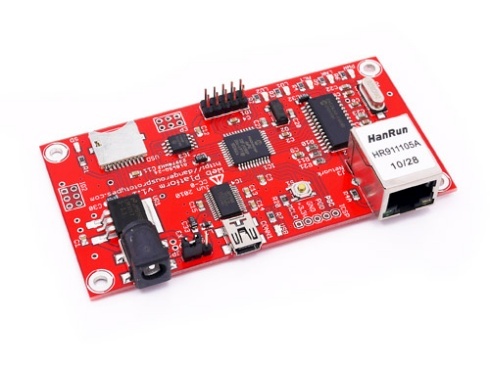 I would like this board if it used the PIC32MX795F512 instead of a 16bit controller, but it is still a great board. When will seedstudio have it back in stock? It still seems to be out of stock? The raspberry pi pretty much pawned this market so I don’t plan to order any more, thanks for your interest though!